Trelew: a tour of the city - Trelew, Patagonia, Argentina. Trelew, a name of Welsh origin meaning "people of Lew" in honor of Lewis Jones, a pioneer of Welsh colonization in Chubut. The city is located 25 km from the mouth of the Chubut River, 20 km from Rawson and 1436 km south of Buenos Aires. The city's history is closely linked to the Welsh settlement in the province, which began in 1865. The day taken as the anniversary of the town is October 20, 1884, when National Congress passed the law to build the railway from the valley where the Welsh grew to Bahía Nueva (now Puerto Madryn), from which crop out to the outside. Trelew station arises in this context as "tip rail" for the transfer of those agricultural products to Madryn. 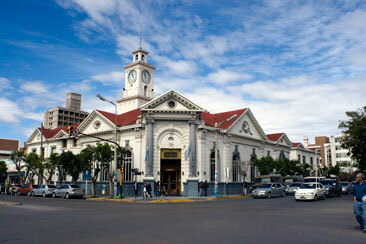 Trelew has been, historically, capital city of the region called the lower valley of Chubut River on the Atlantic coast. It develops, at present, an important industrial, economic and financial activity, for what it is, therefore, the distribution center of goods and services, communications and transportation hub north-south, east-west, linking the various regions of the province and the rest of the country. 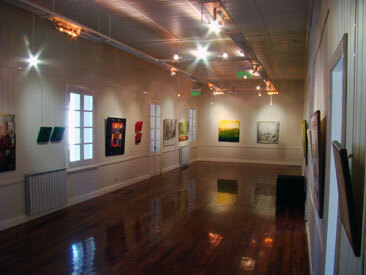 Interior del Museo de Artes Visuales. By the number of inhabitants is the second city of the province, after Comodoro Rivadavia. According to the 1991 census, the city recorded 114,333 inhabitants. The population figures marked a rapid growth rate since 1906.
the Paleontological Museum Egidio Feruglio, very modern building that introduces us into the natural history of Patagonia. the Regional Museum "Pueblo de Luis" is worth visiting. Located on 9 de Julio and Av. Fontana is ideal for intellectuals and curious who want to know the customs of the recent ancestors, tehuelches, mapuches and Welsh immigrants, to show the elements of the railway business, the valley agricultural tasks, parts of natural science and Aboriginal and Welsh culture. the Visual Arts Museum contains a permanent part of the cultural heritage consisting of works of plastic arts of local and provincial levels. Traveling exhibits, classrooms, courses, workshops, lectures, screenings and all sorts of artistic expressions from the classic to the unconventional. La Plaza de las Colectividades. the Astronomical Observatory and Planetarium completes the scientific education provision. tea houses of the Welsh descendants where you can taste delicacies. The city has several festivals that attract large numbers of attendees such as the Eisteddfod and the International Choir Competition, tea Gwyl Glaniad (feast of the landing), and ExpoTrelew among others of various sizes. The town is the starting point to visit important natural reserves in the region: Punta Tombo (the largest penguin colony on the continent), or beyond, the famous Valdes Peninsula with colossal visitors, the right whales. 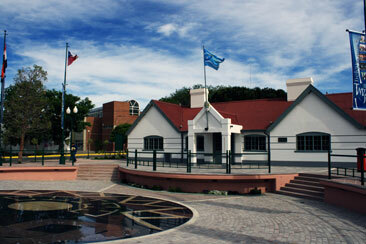 At the same time, Trelew can be often a visit point to those who stay in Puerto Madryn. For its strategic location in the heart of the Chubut River Valley and its location at the crossroads of routes linking the Atlantic coast and the mountains, the city offers the tourist the possibility of a more direct access to all attractions of the province of Chubut in Patagonia. The Nación Bank in the center of Trelew. The service infrastructure is in line with the requirements of all travelers: hotels of various categories, restaurants with cuisine specialized, receptive travel agencies for trips around the region, tour guides with different specialties, international airport, air and ground transportation that enable the arrival and departure to other points of interest and support services are ready to fulfill any need. Know the exact geographic data of this city. Paleontological Museum Egidio Feruglio: the most important of South America Paleontological Museum Egidio Feruglio is a beautiful and impressive architectural space with showrooms showcasing the different geological eras and dinosaur fossils of Patagonia. A Short history of Trelew Designed as the head of the rail to transport the production of the lower valley of the Chubut River to the port, Trelew was born with the growth of Patagonia. Trelew: it production In Trelew meet several economic forces that are described in this report by the Municipality of the city. Tea time, a trip to the past Being populated by people of Welsh origin, Trelew offers visitors the opportunity to enjoy a traditional Welsh tea accompanied by many delicacies. Agroturism in Trelew 2Trelew offers something new; Agorturism: a day in the fields experiencing the production and acitivdades that are traditional in this region of Patagonia. Trelew starting point to see the giant Southern Right Whale Trelew is a starting point for whale watching, to see the Southern Right Whale from Puerto Piramides, a few kilometers away. Bird Watching in Trelew Ornithology, or bird watching is big in Trelew. Ducks, black-necked swans, swans coscoroba and pink flamingos can be observed and photographed. Eisteddfod, a traditional festival The Eisteddfod is one of the most characteristic festivities of the Welsh people and their descendants celebrate it in Patagonia, in the city of Trelew. Trelew: its geography General information on climate, location, geography and demography of the city of Trelew in Patagonia. Youth Eisteddfod One of the most important art expressions of Chubut is the Youth Eisteddfod, held in the month of September in Gaiman.